The other side of Ichijyo Modoribashi (a bridge) from Samurai Juku, the place used to be a huge palace of the nobility in Heian period. This palace was called Ichijyo Tei, the palace at Ichijyo. At Ichijyo Tei, Michitsuna no Haha (935~995) used to live. She is one of the most talented poets and writers of Japanese literature in Heian period. She is a member of the Thirty-six Medieval Poetry Immortals, 36 best poets in medieval Japan. She is also famous for her beauty, and one of the 3 beauties in medieval Japan. During Heian period, the noble woman had their own house and her husband visited her house. Therefore, Michitsuna no Haha and her son, Fujiwara no Michitsuna (955~1020) lived in the palace with several servants. Michitsuna no Haha is a writer of Kagero Nikki, the Japanese literature in Heian period. She wrote about her married life with her husband, Fujiwara no Kaneie (929~990). From today’s viewpoint, she seems to spend a happy life because she is a talented and famous poet, and Kaneie is the nobility of exalted rank and extremely rich. However, throughout her writing, Kagero Nikki, she writes her sad and lonely married life. The Japanese literature in a style of Nikki, a dairy, is not just a diary but it is written based on the specific theme. It can be said that Kagero Nikki’s theme is “unhappy married life”, “a sad life of the noble woman who can just wait for her husband”, or “the fleeting short life of human beings”. The title, Kagero means a mayfly which indicates ephemeral life. Do you know how long it is to wait for a sunrise alone without you? You may not know and that is why you are not here tonight. At her palace in Ichijyo, she may waited for a long time for her husband. Autumn is the season of being lost in thought in traditional Japanese literature. 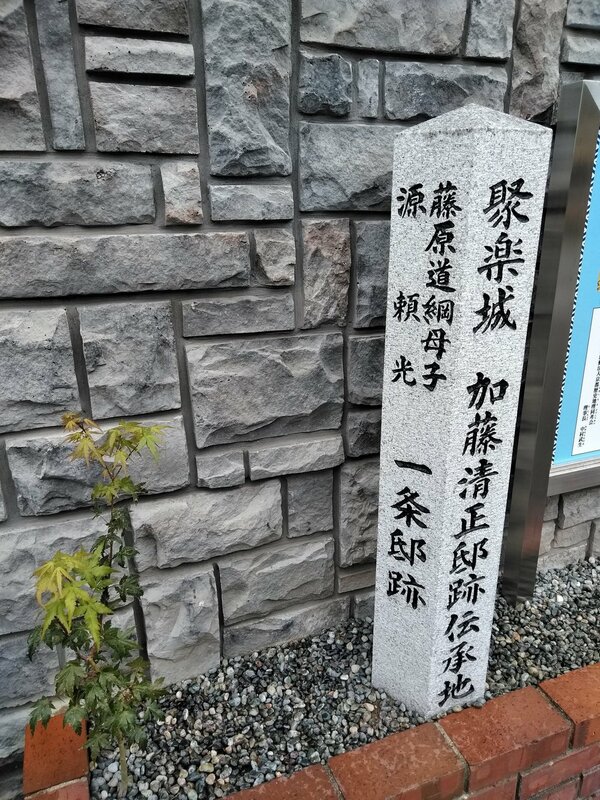 If you are interested in Japanese literature, please read Kagero Nikki and visit former site of Ichijyo Tei. There is nothing left that reminds you of one noble lady’s beautiful palace or her sad married life, but you may feel how fragile a life is. That is the theme that she wrote in a beautiful sentences about 1100 years ago.